What do you desire? How do you wish to feel? What is holding you back? What do you need to let go and create? the antidote to overcoming jealousy is to rejoice in other's successes and help others get what they desire. Reflect on your biggest affliction that continues to keep you in the samsaric cycle of suffering. And see what the antidote is for you to adopt. Try it and see what happens. This is a podcast by Lama Marut that speaks of these afflictions. It's a good listen! He's an amazing teacher and you can find more on him at LamaMarut.org. The book that is referenced in the podcast is A Spiritual Renegade's Guide to the Good Life. 2. One of the keys to cultivating desire in a way that does not encourage more afflictions is to want with all your heart but do not get attached to the outcome or the result or even attached to the desiring. Very very tricky. "Behind every desire there is a feeling. And your feelings will lead you to your Soul." ~ Danielle Laporte So how do you want to feel? 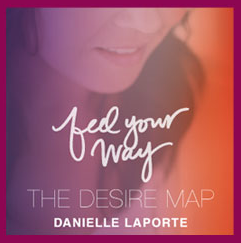 Once again, Danielle Laporte's Desire Map is a key reference to this Gem. Let's identify some CORE DESIRE FEELINGS! Here is a list of feelings to get you started. Once, you identify how you desire to feel in these areas of your life, you can start to create ways in which those feelings have a place to arise. For example, within my body and wellness, I want to feel thin, light, free and strong. If these are my core desire feelings in relationship to my body and wellness, then my food choices will be determined by wishing to feel thin, light, free and strong. I'm not going to go for the pasta primavera with extra sauce because it will not give me my core desire feeling. I may choose something like a green salad filled with vegetables and a mango dressing instead. And so, once you identify how you wish to feel, you will also start to feel that way and attract the same kinds of feelings in return. For example, each feeling is like a light beam that can attract a reality. Generosity and love and support and kindness usually elicit similar responses. Give it a go. See how it feels! Feelings are felt in the body as an immediate response to an experience. Feelings are not necessarily coming from the brain. They are felt in the body and are super sensitive. Feelings are the language of the soul where intuition resides.They are vibrational and they are constantly responding to what's happening in and around us. Feelings are fluid. They come and they go. Emotions are a collection of imprinted feelings that have been organized in the brain and can be interpreted as "energy in motion". Emotions consist of thoughts, stories and beliefs. Emotions can get stuck and create patterns that are not necessarily in alignment with out desires. Focus today on differentiating between your feelings and your emotions. Feelings are fluid. They change. Emotions tend to be more reactive and are more rigid. Feeling good and happy is the goal! Go for it! P.S. Listen to your feelings. Let them go and you will experience desire without attachment.